Ganesh and I dropped by Buffalo Technology at CES 2013 to get a look at their upcoming products. I'll leave most of the MiniStation NAS news to him as that's his area of expertise, but I saw three other things that sort of fit under my umbrella. First is an update to Buffalo's 802.11ac router lineup. If you'll recall, Buffalo was first to market with an 802.11ac router based around Broadcom's introductory 802.11ac reference design with a BCM4706 SoC at the core. Buffalo announced a refresh to those devices with a three-stream and two-stream version based around their new BCM4708x SoC which we've talked about before. The new routers are called the AC1750 and AC1166, respectively, for three-stream and two-stream ac. The two-stream version will go on sale for $149, the three-stream version will cost around $179 early 2013. 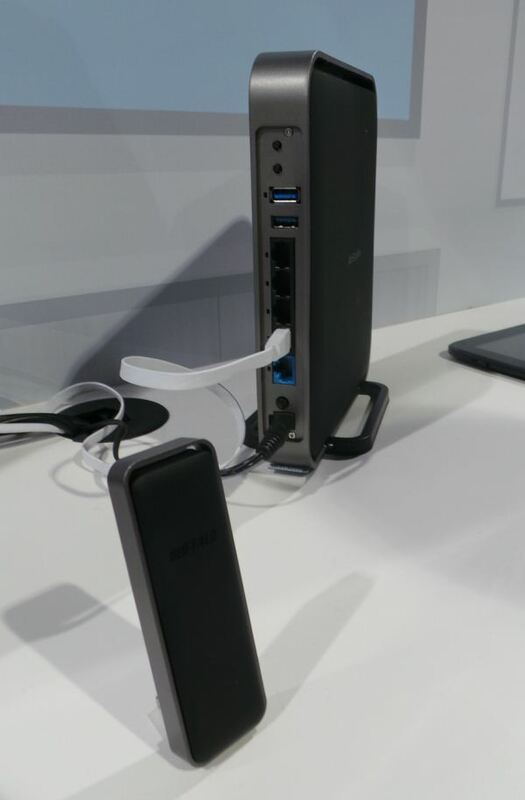 These also add support for 802.11ac beamforming which the previous generation lacked, the faster SoC, USB 3.0 support (and faster NAS throughput), improved QoS that uses all the Broadcom accelerators, and most thankfully a fully revamped UI. The new UI includes a mobile-optimized version which looked very nicely polished, and a desktop version with simple toggles and very clean visual appearance. I think this might be the best part of the new routers, as the previous generation 802.11ac Buffalo routers had an extremely difficult to navigate web interface. This new faster SoC now enables 802.11ac routers to fully saturate the 1300 Mbps PHY, routers based on the previous generation were actually gated by that previous generation's SoC performance, as Ganesh and I discovered. Buffalo also announced a two-stream 802.11ac USB 2.0 dongle called the AC866 (pictured above) which will be priced at $69. I'm still wishing and hoping for a USB 3.0 three-stream 802.11ac dongle to appear somewhere. The next news is an update to the Buffalo MiniStation Thunderbolt which I reviewed a while back. This will now come in an SSD-enabled flavor in addition to the two current SKUs that include HDDs. I'm told that the design will include a Toshiba SSD, though I don't know exactly which Toshiba SSD is inside, nor was there any information on pricing or storage size (I believe 240 GB was shown). An SSD version is already shipping in Europe but with a lower-end drive inside. 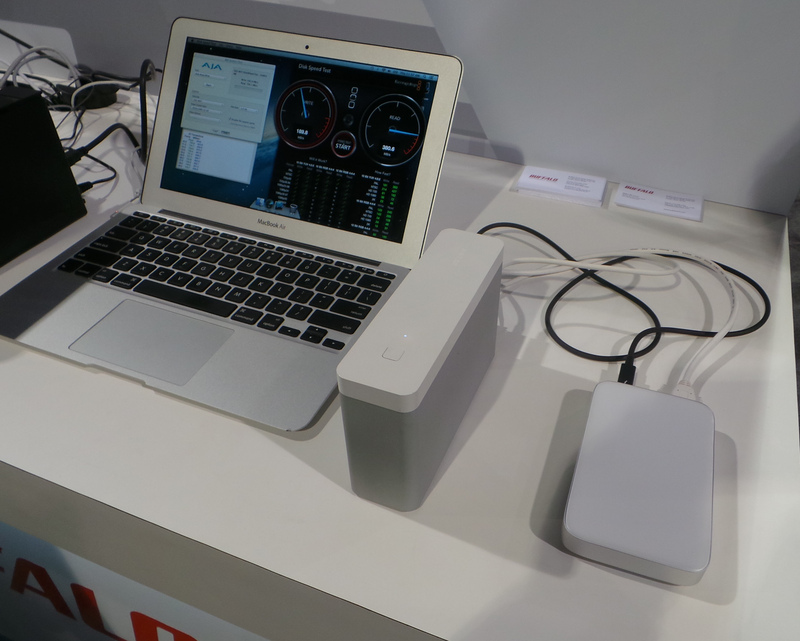 Buffalo was showing around 180 MB/s writes and 380.3 MB/s reads on the MiniStation Thunderbolt SSD in a daisy chained setup at their booth. The device daisy chained with the MiniStation Thunderbolt SSD is a new product that doesn't quite have an official name yet. This is a dual drive version of the MiniStation Thunderbolt running a RAID-0 with two of the same Toshiba SSDs used for the Thunderbolt SSD. There's also the higher end Thunderbolt controller inside to support daisy chained setup. The two-drive version isn't designed to allow users to change the drive inside, just like the current single drive MiniStation Thunderbolt, and is Thunderbolt-only (there's no USB 3.0 on the back). Buffalo was showing sequential write speeds around 600 MB/s and reads of around 700 MB/s. The Thunderbolt duo drive will be announced in the April or May timeframe. This depends. To be honest I have yet encounter a SINGLE Consumer Router that is fast and stable. There may be some which could be fast enough, but none of them are Stable in my views. ( And that depends on personally standard ). I dont expect the router to crash for at least 3 - 6 months of operation. That is the bare minimum. I dont expect the UI to be non accessible, which requires a restart to correct the issue. Even with DD-WRT the story is the same. And my guess most of these stability are Software problems which is a continuous cost to support. This has always boggled my mind. For now, it only drives the cost up, and more often than not, to a point where most people would not buy it. An ssd is great if it's a system drive or maybe as a scratch drive, but due to their price and performance quirks and indeed durability, are, in my opinion, not meant for these kinds of devices. Whilst durability now is not a problem, as price will go down by a function of better (smaller) lithography, the durability will suffer, and whether it will become an issue or not, is not known at this point in time. I believe the use case everyone envisions for SSD thunderbolt or USB 3.0 devices is as you put it, either a media source drive or scratch drive. I've been working with some 1080p60 and 4K video from the GoPro and even though the source is maybe 30-40 Mbps working with it in any appreciable fashion basically necessitates an SSD. I'm not a videographer but that's the kind of magical use case I think OEMs dream about for these things.